Magic the Gathering! Dungeons & Dragons! Board games! Other Games! The brand-new Magic’ set is coming to finish the storyline of the evil elder dragon Nicol Bolas’ rampage throughout the multiverse, pursued by the planeswalkers of The Gatewatch and a new team of allies! ‘War of the Spark’ brings this cataclysmic conflict to the plane of Ravnica and sees the most powerful beings in the Magic setting squaring off against each other for keeps… And it’s been heavily hinted that one of the Gatewatch isn’t going to make it through this struggle alive. 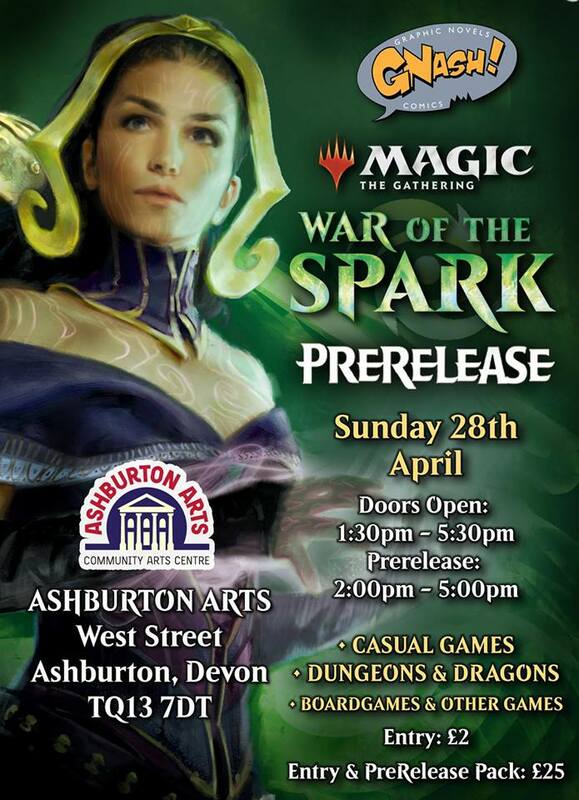 To mark this event that crowns the Magic storyline, Gnash is returning to the brilliant Ashburton Arts venue to host an afternoon of diverse gaming! • Entry is £2, come and play casual Magic games, Dungeons & Dragons, Star Wars Destiny, boardgames, other games, or any game you’d like to bring with you. Play titles from the Gnash board games library too! Bring along your friends and family and make an afternoon of it! • We have small Magic sample packs to give away to new players! • Pre-Release pack and entry combined is £25. The Pre-Release runs from 2pm to 5pm. Your Pre-Release pack is a unique pack exclusive to Wizards Play Network shops like Gnash Comics! It contains; 6 booster packs of brand-new cards from the ‘Ravnica Allegiance’ set (the sixth pack is guild-specific, your choice), a rare or mythic-rare date-stamped foil promo card (only available in these packs), a life counter die and a guide. • 1st place: 4 ‘War of the Spark’ booster packs. ‘Standard Showdown’ pack. • 2nd place: 3 ‘War of the Spark’ booster packs. ‘Standard Showdown’ pack. • 3rd place: 2 ‘War of the Spark’ booster packs. ‘Standard Showdown’ pack. • 4th place: ‘War of the Spark’ booster pack. ‘Standard Showdown’ pack. • Last place: ‘War of the Spark’ booster packs. consolation prize. • The Top eight PreRelease Tournament players also get an ‘Haunt of Hightower’ promo card! Want a Pre-Release pack but don’t have the time to play in our tournament? That’s fine, just come along and pick them up! They’ll cost £23 each. Please note that we may not be able to accept debit/credit card payments at Ashburton Arts, so please bring cash.